World ‘Restaurant Day’ is every wannabe chef’s dream come true. On four days during the year, just about anyone, anywhere can open up their own restaurant for a day. The idea started in Helsinki in 2011. It’s now spread to some 70 countries around the world. I took part in the first Restaurant Day of 2016. I was so impressed by the spirit of the participants that I wrote this short article on it at the time. Top Photo: Sisters Thuy An and Huyen Duong Nguyen prepare Vietnamese dishes at home with their mother. Photo by Mark Baker. Posted in Diversions, Life In Prague and tagged Czech, Czechia, Food, pho, pop-up, restaurant, Restaurant Day, Syria, Vietnam. "Food opens minds." Vietnamese sisters Thuy An and Huyen Duong Nguyen look forward to World Restaurant Day. Photo by Mark Baker. 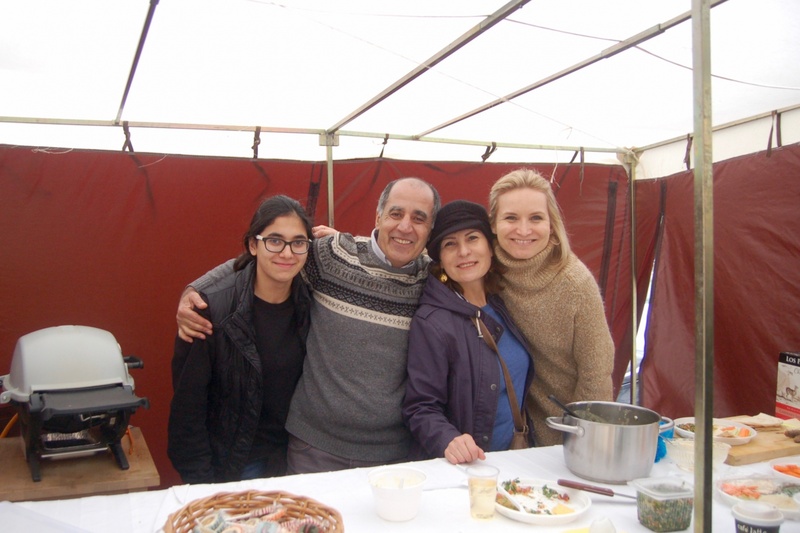 Syrian refugee Majed Tafech poses with friends and family on World Restaurant Day in Prague. Photo by Mark Baker. In the Czech capital, Prague, World Restaurant Day has been embraced not just by amateur Czech chefs to show off their skills, but also by cooks from the city’s various immigrant groups as a way of introducing their foods and customs to a sometimes skeptical host country. The first Restaurant Day of the year -- held in February -- was a typically blustery winter day in Prague, but that didn’t stop dozens of would-be restaurateurs from opening their own pop-ups. We made the rounds and made some friends along the way. 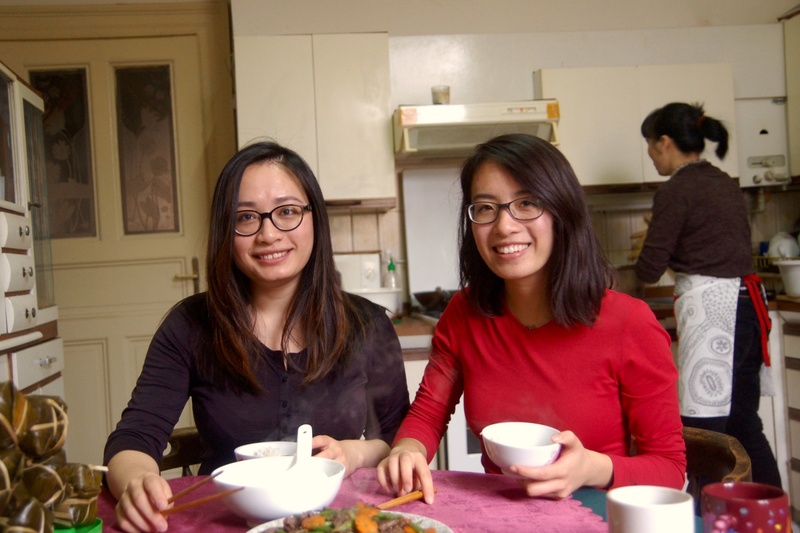 Sisters Thuy An (An) and Huyen Duong (Duong) Nguyen, both students in their 20s, were born in Vietnam but came to the Czech Republic as young girls with their parents, who were seeking a better life. Some 60,000 Vietnamese live in the Czech Republic, making them the largest non-European immigrant group in the country. Though the Vietnamese have been here for decades, many Czechs remain unfamiliar with Vietnamese customs. While Vietnamese restaurants have become more common in Prague, An says that Czechs generally only know the most popular ‘Westernized’ Vietnamese dishes – such as phở (beef noodle soup) or bún chả (grilled pork and noodles). “They don’t really know the foods that we cook and eat at home every day,” she says. For their pop-up, held in the garden of the family’s modest apartment in the Prague neighborhood of Nusle, the two (with the help of their mother) prepared an ambitious 11-dish menu centered around staples of Vietnamese cooking such as fish sauce, fresh vegetables, coriander, meat, seafood, and rice, but served in combinations that don’t always appear on Vietnamese menus. The guests were treated to relative rarities like thịt bôi đên (braised pork with eggs) and canh dưa chua (hearty soup of beef and pickled vegetables). Majed Tafech relaxes with visitors at his food stand on World Restaurant Day. Photo by Mark Baker. 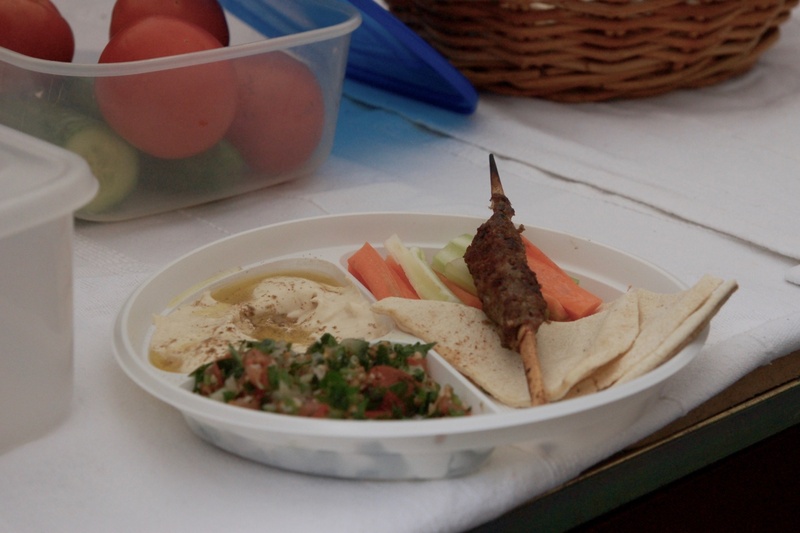 Middle Eastern staples like hummus and kebabs are beloved the world around -- and also in Prague. Photo by Mark Baker. 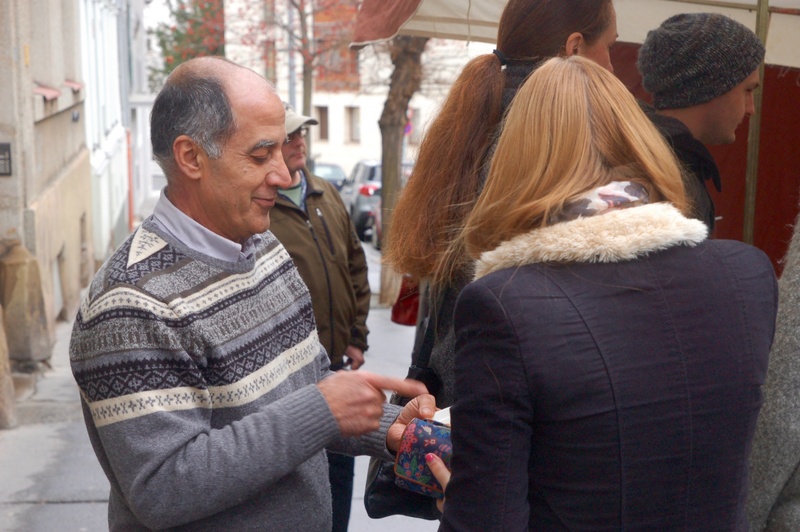 The opportunity both to demonstrate his prowess in the kitchen and to introduce Czechs to foods popular in his native Syria is what motivated 59-year-old Majed Tafech to take part in Prague’s Restaurant Day. 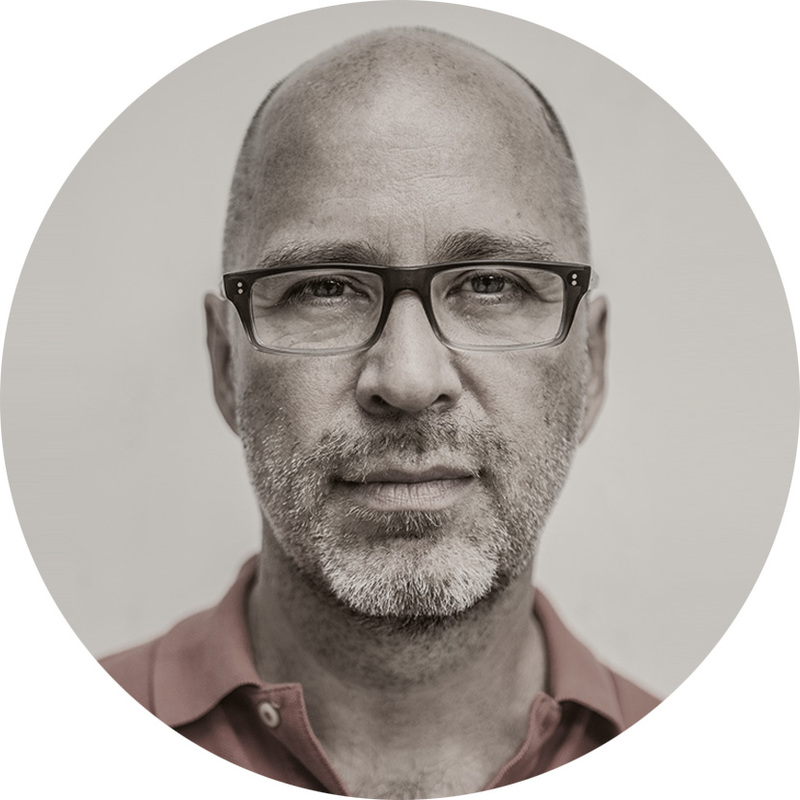 Tafech, an architect by training, moved with his wife and two high-school-age daughters to the Czech Republic via Denmark in 2014 after spending several years in exile in Lebanon. As hundreds of thousands of migrants from war-torn Syria have flooded into Europe, attitudes across the continent toward the arrivals have hardened from initial acceptance to apprehension and, in some cases, hatred. Many fear that an encroaching Islam could threaten modern European ideals of democracy and equality. Majed's soft eyes and warm smile immediately put the worst of those fears to rest. “I’ve had a hard time finding a job here,” he says. “But I’m trying to make it work.” In addition to learning Czech language full-time, he has volunteered with various aid organizations helping to accommodate incoming refugees. One career opportunity Majed is considering is opening a restaurant, and he’s using Restaurant Day to help gauge local interest. Middle Eastern foods like kebabs, hummus, and tabbouleh (a salad of chopped parsley, mint, bulgur) are beloved the world over. On this day, the response among Czechs to his cooking is so keen, he sold out of everything in just a couple of hours.